So.....I made another light fixture and now my capiz shell chandelier has a friend. Meet our newest addition!! Today, I'm going to walk you through how I made this beauty. You may recall from a previous post that we had a bit of a chandelier mishap in our home recently. 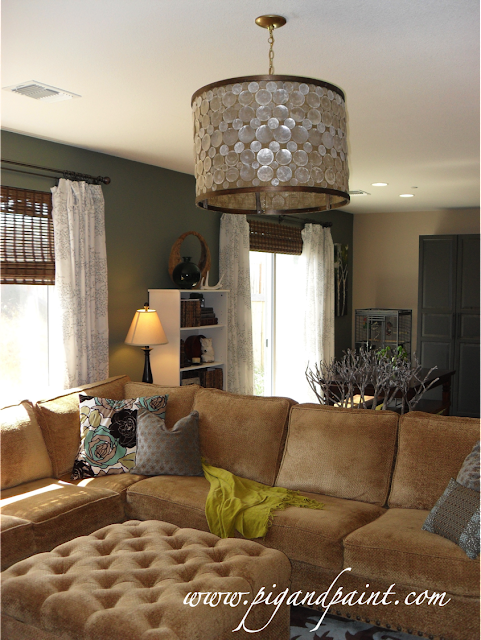 No, my capiz shell chandelier was NOT harmed, but the quaint chandelier in my family room WAS harmed. One thing led to another and suddenly I was enthusiastically Rockette-kicking my way into a new DIY project. 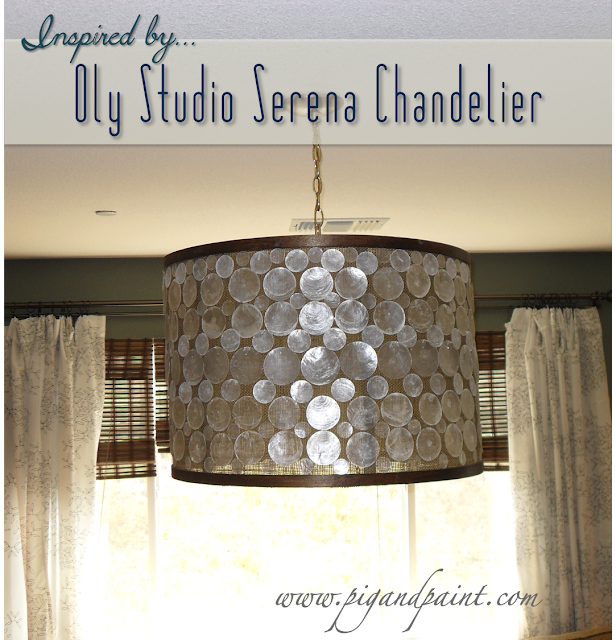 My inspiration was this Oly Studio Serena drum shade fixture, which retails for a whopping $2,850 (O to the M to the Gee-whiz!!). I know, it's pretty, right? Don't forget.....it's rubbing elbows with THREE THOUSAND FREAKIN' DOLLARS. So, I decided to make it myself. 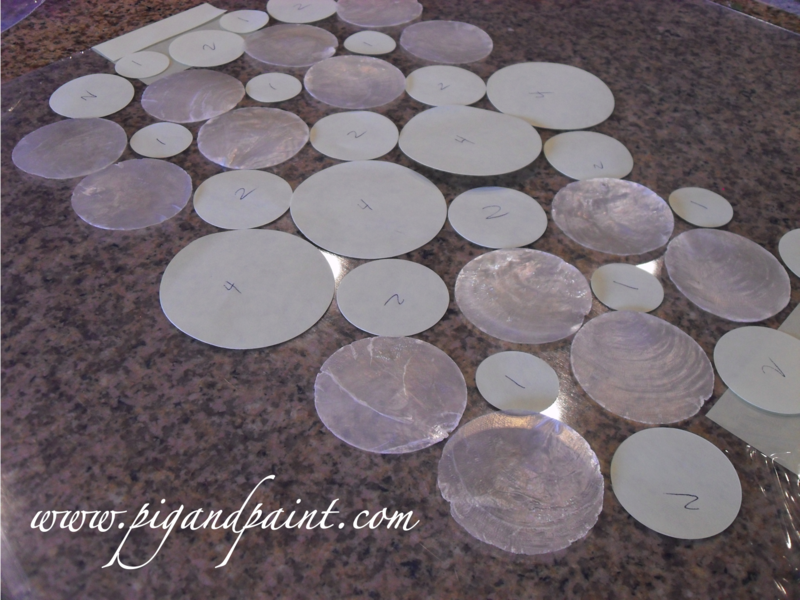 One important item of note: I almost made hundreds of DIY wax paper capiz shells for this project. Almost. I didn't want to spend the money on real shells this time.....but after test-driving some wax paper shells, I just wasn't feelin' it. I even glazed the wax paper with a metallic taupe-y paint, and I've gotta say, it looked nearly real....nearly. I just couldn't do it. So, I ordered real capiz shells from a new company, Caribbean Imports Shell Outlet and so far I'm pretty stinkin' happy, primarily because this company lets you order capiz shells in the EXACT quantity you need -- none of this having to buy in pre-packaged bulk quantities. For comparison sake, I spent $70.80 on real capiz shells for this project (that includes tax and shipping, and I ordered extra shells, just in case). It would have taken me many, many hours to make the hundreds of fake-looking shells for this project if I had gone the wax paper route. Sometimes I have to put the brakes on my DIY-brain, and remember that good quality ingredients will make a good quality product, and I really wanted this fixture to be a Rachel-Berry-calibar STAR (and I'm sort of embarrassed that y'all are just now finding out that I am a HUGE, psycho Glee freak. My deepest apologies! We should have been talking about Glee months ago!). I searched the web high and low and couldn't find any one else who had attempted to make this fixture successfully, so I made it up as I went. Remember, you saw it first on Pig & Pant! Ready? Here we go! Step 1: the source of light. 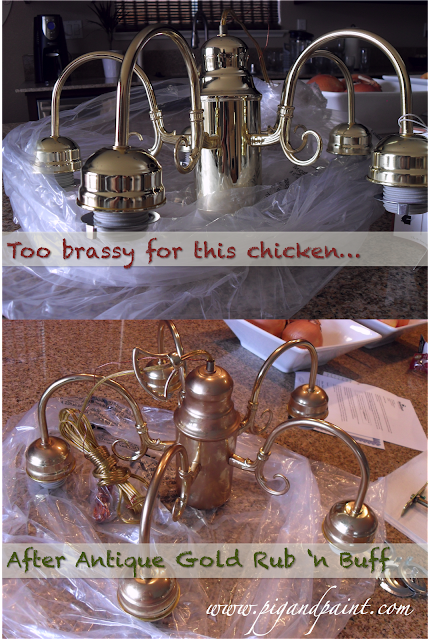 I purchased a cheap, brass light fixture for $36.99 on Overstock.com. I had bold intentions in buying this brazen brass, but chickened out and ended up rubbing some Antique Gold Rub 'n Buff all over the brassiness to tone it down just a hair. 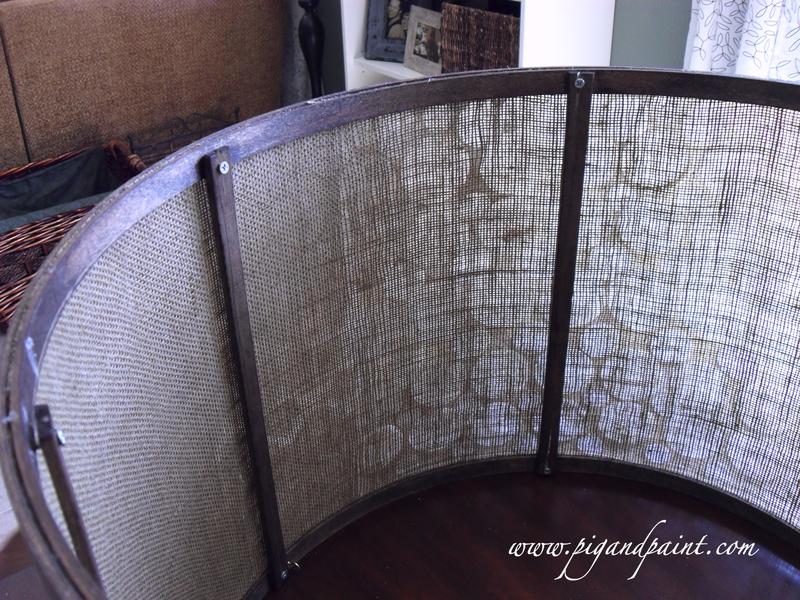 Step 2: the drum shade frame. I purchased two 23" quilting hoops on amazon.com, and separated the inner hoops from the outer hoops. I used a flat head screwdriver to gently pry the small wood blocks off of the outer hoops. I stained both the inner and outer hoops with a dark walnut stain. Step 3: the supporting cast. This step tried my patience BIG TIME. I tried affixing thin, clear template plastic (also known as craft plexiglass) to my hoops to no avail. I initially tried using hot glue as well as construction adhesive to glue my plexi around my quilting hoops, but it just wasn't working for me.....so I purchased a bunch of antique brass brads, hoping to drill small holes through the quilting hoops and plexi, and use the brads to pull the whole shootin' match together. No dice. Then I thought I'd try rigging everything together with fishing line (don't ask). 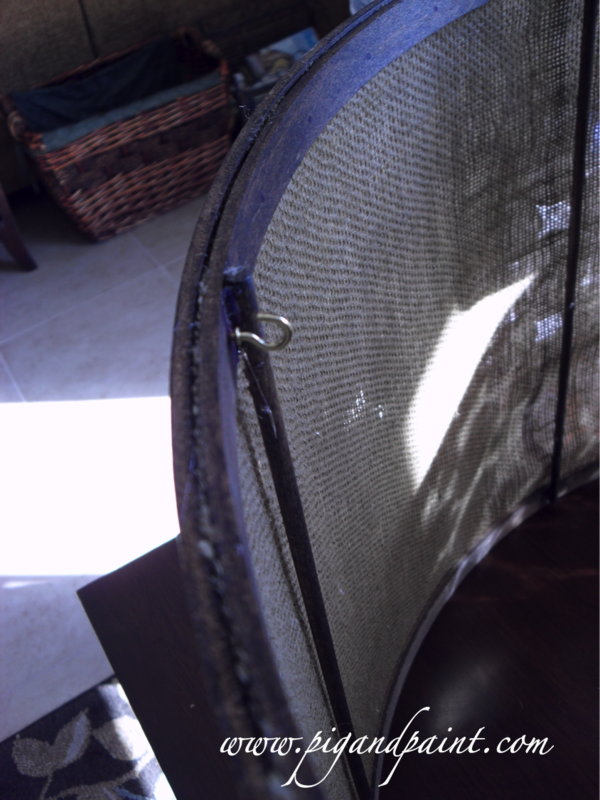 I, then, tried attaching 6 dowels (stained to match the hoops) to the inside of the two inner hoops, using copious amounts of hot glue. This seemed to work ok for a little bit, but ended up not being a sturdy enough solution. I later ended up having to swap out the dowels for thin, flat pieces of board (stained to match) that I screwed into the frame with teeny tiny screws. 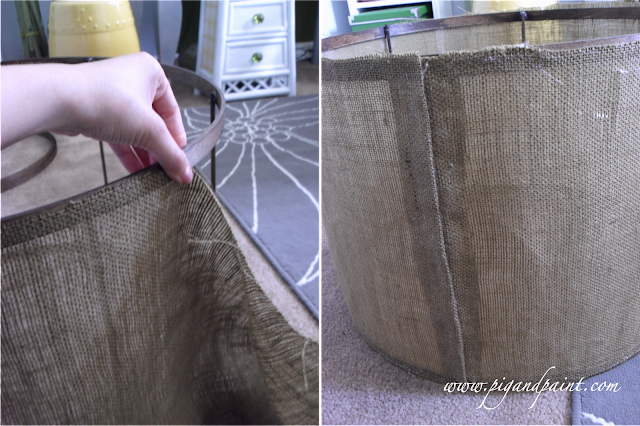 I then glued burlap around the exterior of the inner hoops. Once the burlap was in place, I glued the outer hoops around the top and bottom edges. Step 4: the bling. I bought capiz shells in 4 different sizes. 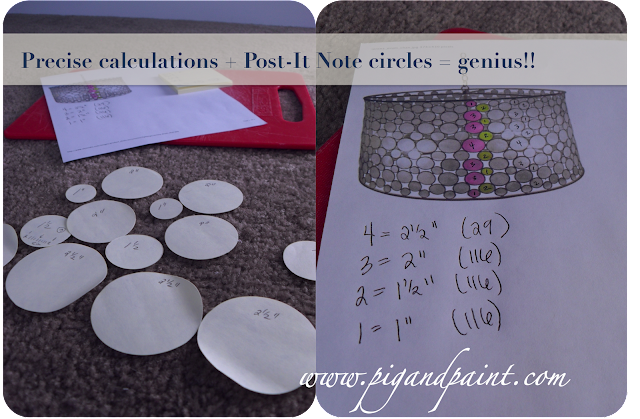 I had to do some high school algebra in advance to make sure my shell formation and sizes would fit nicely within my 23 inch diameter hoop (the circumference is equal to pi times the diameter: 3.14 times 23 in my case). 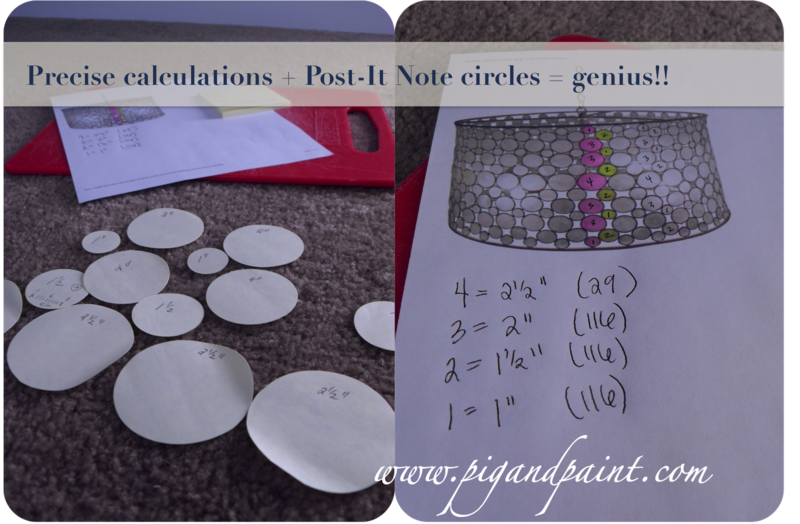 At the same time, I cut out sample circles out of post-its, so that I could lay out the pattern to ensure it was properly scaled. I ended up with 29 2.5 inch shells, and 116 each in 2 inches, 1.5 inches and 1 inch size shells. I "dry-fitted" my post-it circles (and a few capiz shells I had leftover from this project) to get a feel for the pattern. I was happy with how it looked, so I ordered my shells. Step 5: assembly. I began hot gluing my shells onto the the burlap in a pattern matching the one in my inspiration photo, using a very small amount of hot glue at the top and middle of each shell. It was very important that my spacing between the shells be exact so that my fixture wouldn't end up looking lopsided. I started with my #4 shell (2.5"), and used my long-level to make sure the middle of each shell sat right around 8". I glued my shells concave out (i.e. pac-man mouth out). I added a row of #2 (1.5") shells on either side. Then, a row of #3 (2") shells on either side. And then, a row of #1 (1") shells on either side. I took this picture because I just couldn't wait to see how it looked in the room...so I used the timer feature on my camera and ran like the wind! YAY!!! Step 9: the annoying details. This step will vary depending on your light fixture set-up. In my case, I was able to attach three strands of gold chain to a gold key chain, and inserted the keychain just above the fixture (I unscrewed the top part, inserted the key chain and then re-screwed the top back on). 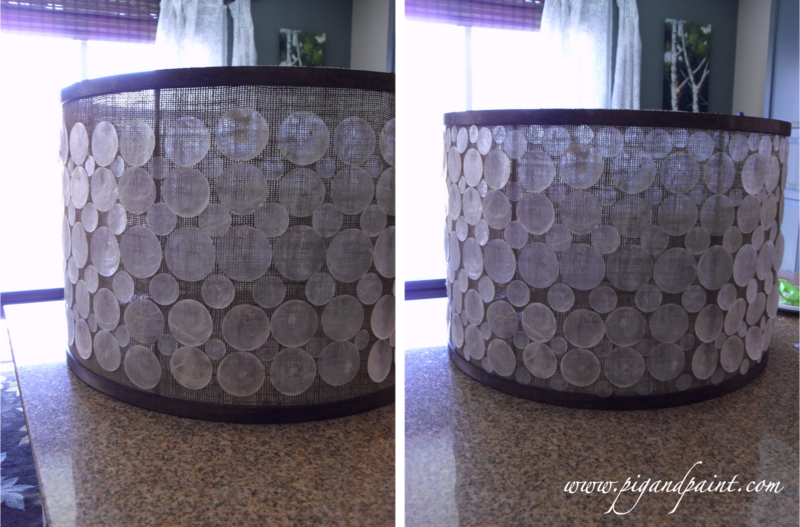 With the help of the hubster, we installed three cup screws into the inside of what would be the bottom of my drum shade. For clarity sake, the drum shade is upside down in the picture below. Step 10: everybody on the ceiling. Par-tay!! I shut off the power in the family room, and hardwired my fixture into the ceiling. 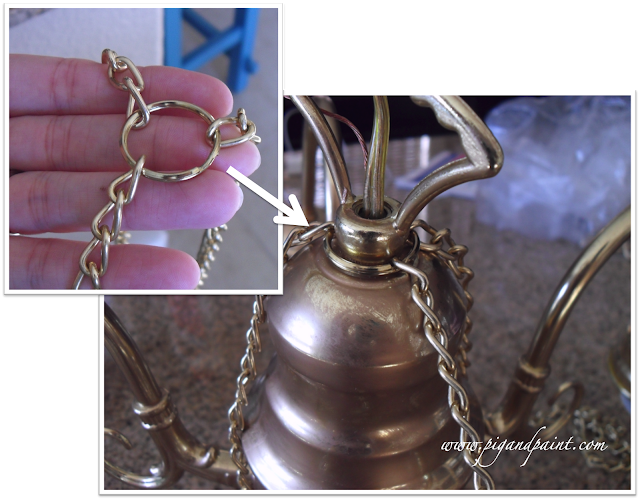 We, then, hooked the drum shade onto the three gold chains, using the cup screws we had attached to the inside bottom of the frame. And, now it looks like this! I'm SO thrilled with the result! 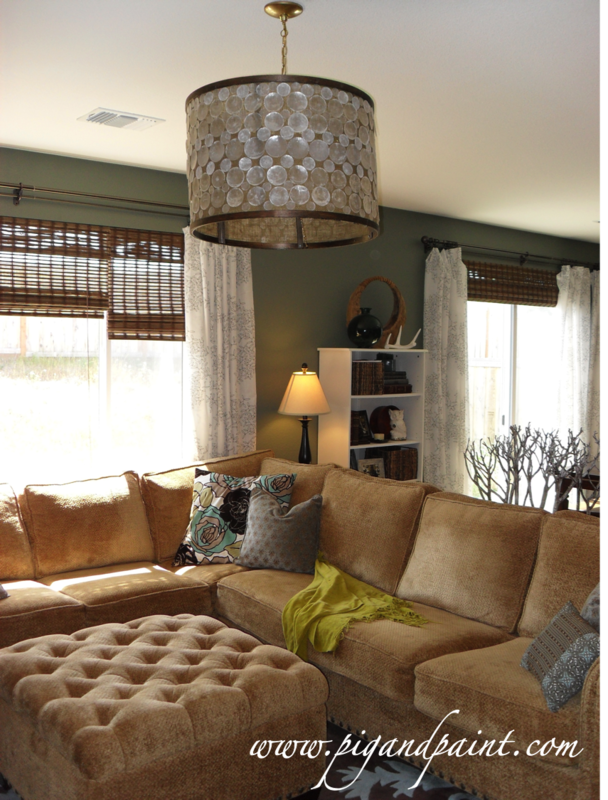 The bigger fixture it better scaled to the size of the room, and it makes such a statement. Woot!! 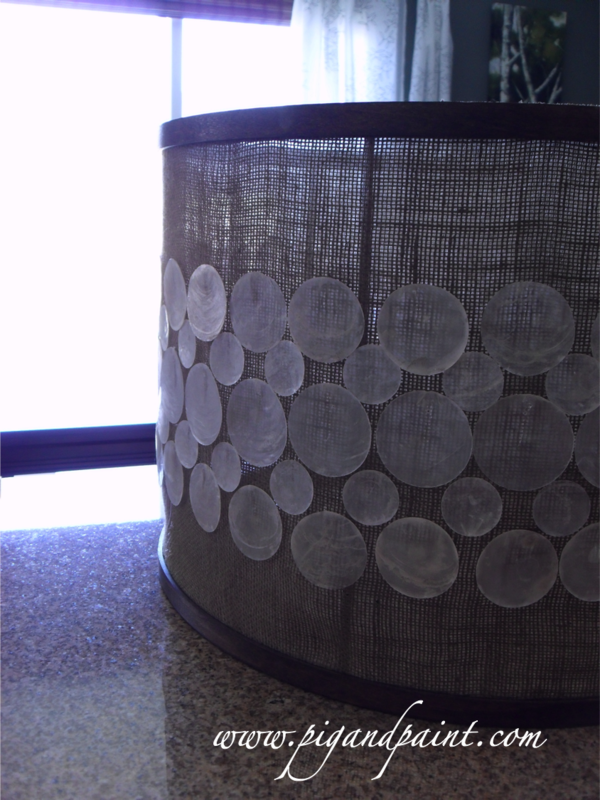 I ended up spending about $150 on the entire fixture (half of which was spent on real capiz shells). Compared to $2,850, I'd say this is a steal of a deal! Can't get over how brilliant this is! So does not look like a diy!!! You go girl!! You are incredible! 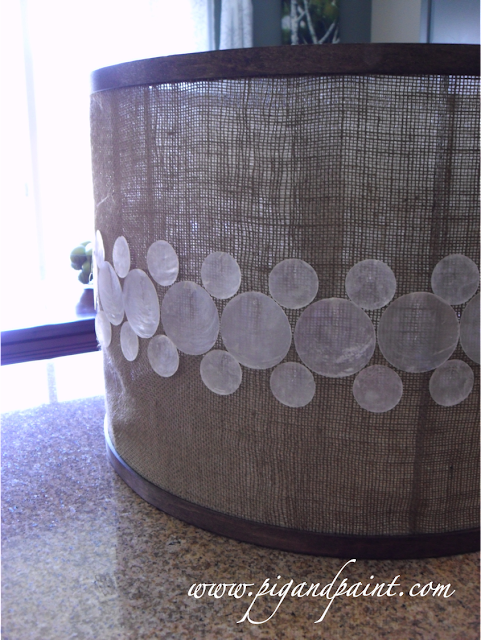 What a great way to construct any drum shade, but the shells just make it beautiful! It's so clever! I think it works so well in the room and I like it's larger size. I never would have guessed you really made that!! FBing! absolutely fabulous! way to go! 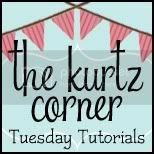 I love your blog and all of your awesome ideas! So stinkin' clever you make me smile and smile. Love that you showed how to make the shade frame from first to last. 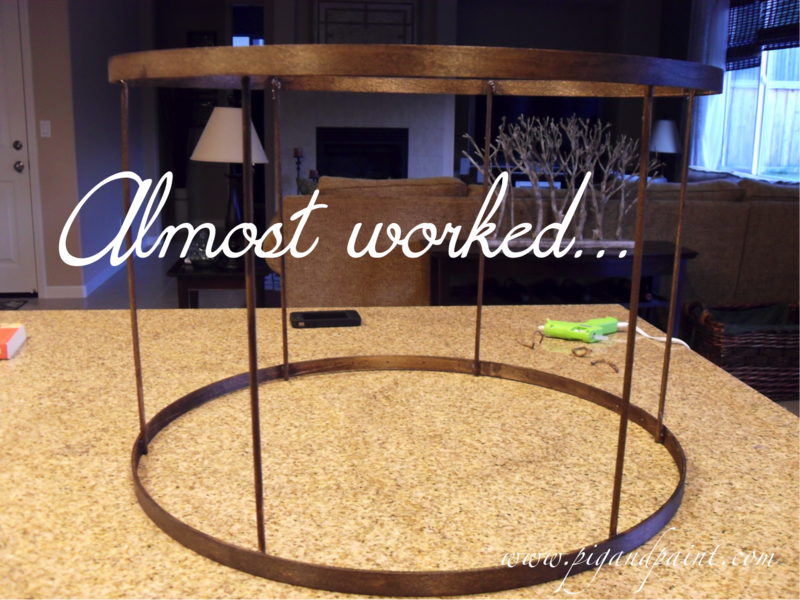 I just pinned this project, too. This is a-m-a-z-i-n-g!! What a statement piece, your living room looks gorgeous. You are right, the scale is perfect for your room. 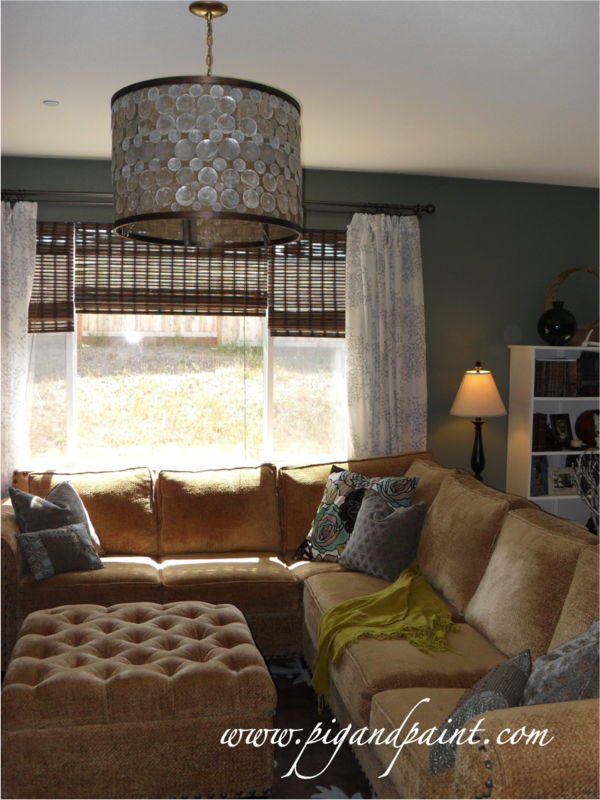 And of course, I love the little bit of bling it adds to the room without being over the top. 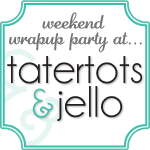 Love the name of your blog...I think that I may have even giggled when I saw it. Now following, excited to see what you are doing next! Hooray!! You were featured and pinned!! Come grab a featured button and check it out! You are amazing and patient! Thank you SO MUCH for posting about this project! (I am here from Home Stories A to Z.) I am grateful for your inspiration. I want to upgrade my shiny brass chandy with a DIY shade and your ingenuity has helped me out so much. THANKS!! Could you clarify how you kept the hoop ends together in Step 2 after removing the screw-thingy. Did you glue them? Or maybe you staggered the ends of the inner and outer hoops? I just recently found your DIY and I LOVE it! I am working on it now and I'm so excited but frustrated already. I have my 2 hoops taken apart (so I have 4 total; 2 inside/2outside) BUT the outside 2 that had openings will not close! :( I've tried wood glue and clamps~ I even tried masking tape spray painted...that looks terrible. How did you ever get your 2 outside hoop ends fitted together? I am almost ready to staple with my nail gun but I'm worried I'll split the wood so I thought I'd ask the expert (YOU) first! Hope you can help. This is so beautiful. You do amazing work. I'm tempted to try something similar to this over my dining room table. Thanks for the tutorial! Personally, I think yours looks better than the inspiration piece. I love it when DIY doesn't LOOK DIY...great work. Totally cute. Can you tell me where you purchased the flat pieces of board for your frame? 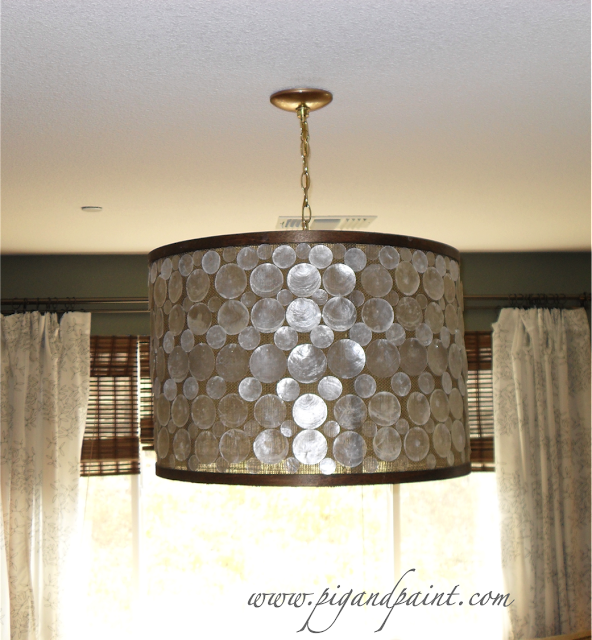 I would like to make something similar but to cover over an existing chandelier - thanks for the inspiration! Thanks!! I got the flat pieces of board at Lowes, in the moulding section. :) I'd love to see pictures of what you create when you're done! 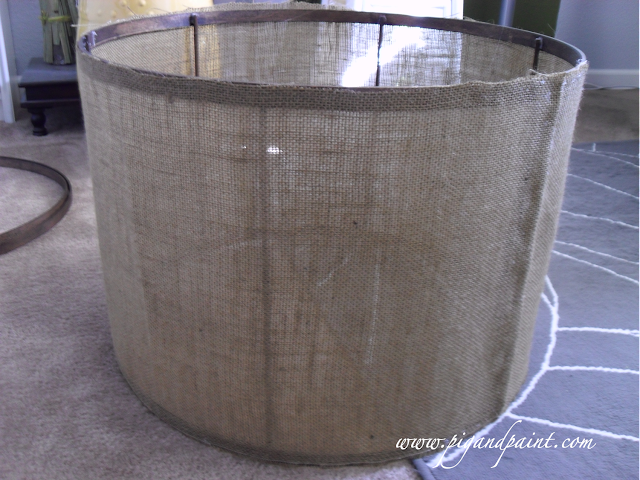 I think your shade is much prettier than the manufactured one and looks beautiful in your home. 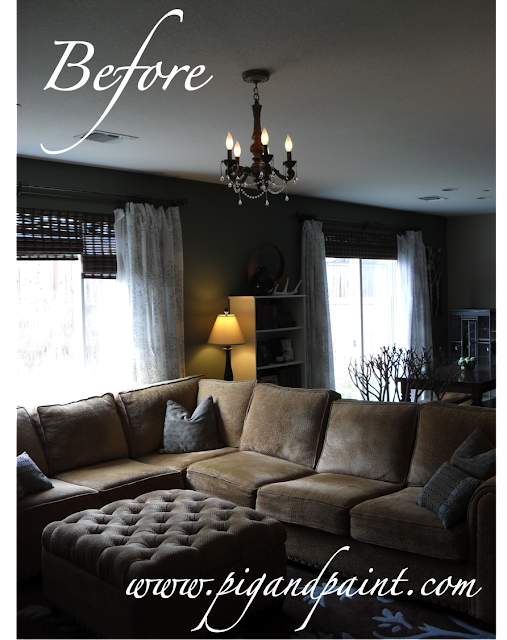 It certainly is better portioned than your previous chandelier. I'm not as resourceful or as creative as you and would love to make this shade. I have been thinking about making my own drum lamp shades and sell them on Etsy. I have been looking for different tutorials on how to make them to find the best fit for me and came across yours....let me say I am so impressed! Awesome job, you should be proud! Looove your light fixture, I think I am gonna go for it, ready to make my own! 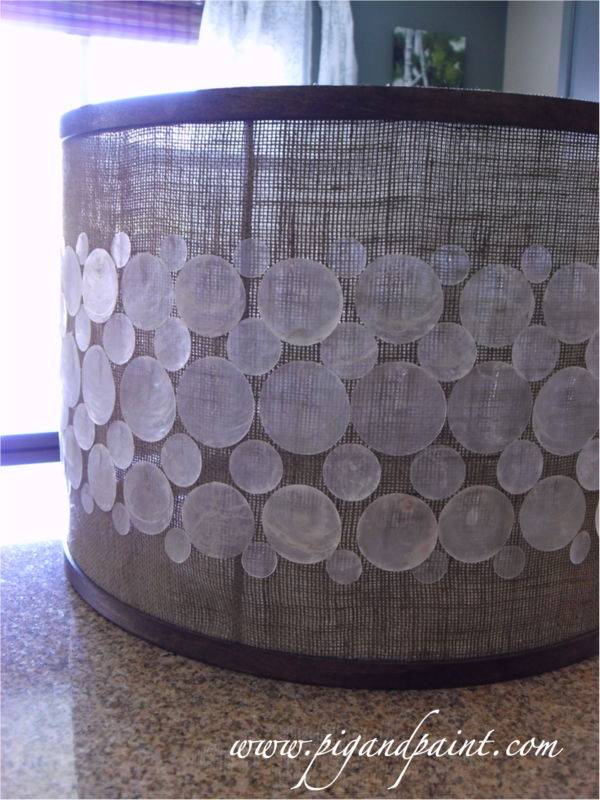 Fixtures like this with the real capiz shells are super expensive, but mine wont be thanks to your tutorial! How many inches long is your shade? I know the hoops are 23 inches but I just wanted to know how long you made it from the top to the bottom? Thanks! Oops, my first name Jeanna forgot that on my last comment lol. How many inches long is your shade? I know the hoops are 23 inches but I just wanted to know how long you made it from the top to the bottom? Thanks!Look forward to hearing back from you! 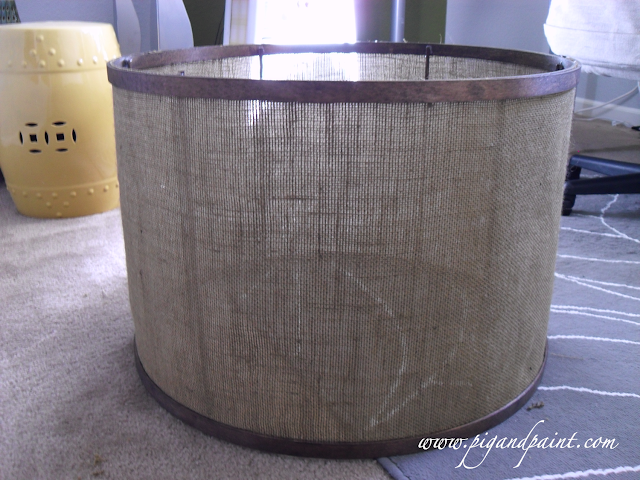 Wish me luck - I'm going to try this for myself...I'm SOOOOO happy to have found your sight and thanks so much for your great directions...I'm going to put the drum shade over a crystal chandelier...going to use damask fabric, no shells...if it works I'll send you a pic!! Gorgeous! 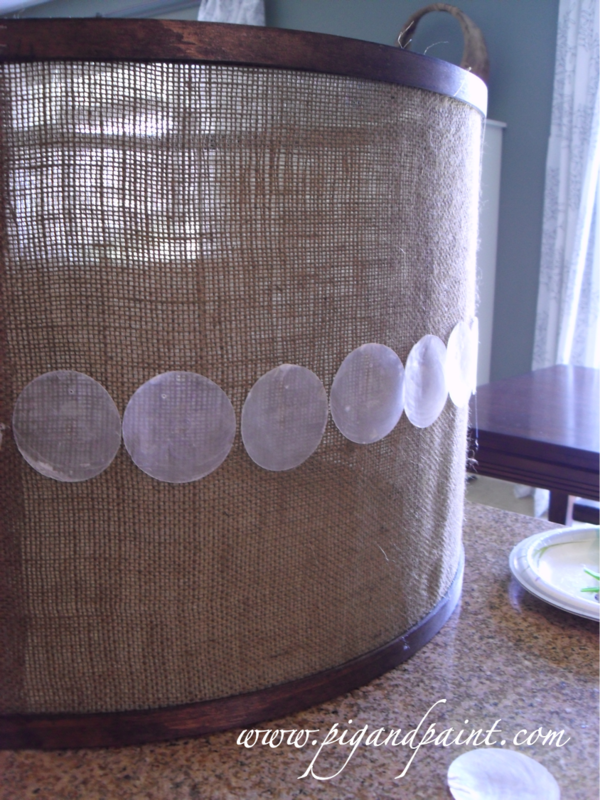 I have a ton of capiz shells hanging around (I bought them for a DIY headboard project I was concocting, but ended up going in a different direction) and was just thinking about creating some sort of light fixture with them. I bought the un-drilled type, and this kind of project is the perfect inspiration for me! Nikki from Tikkido. You did an amazing job! Thank you for posting this tutorial! I love the large scale. 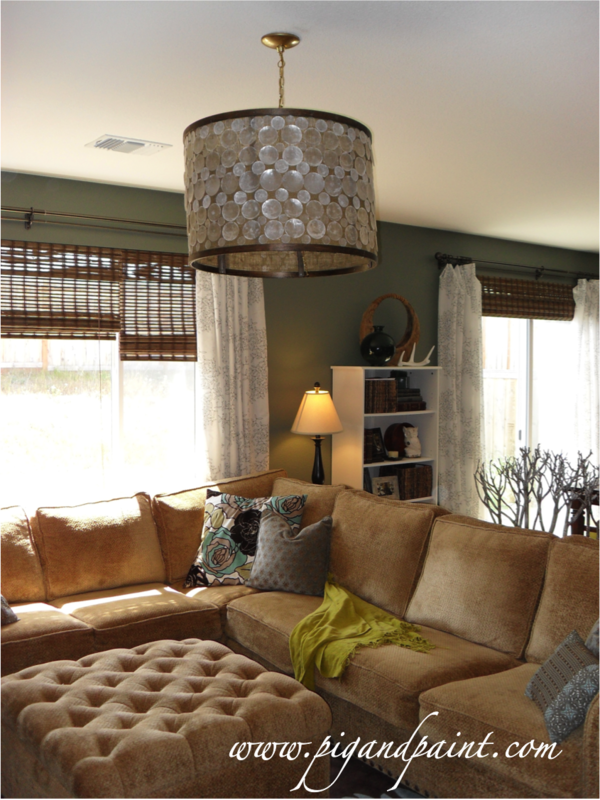 What is the height of your fixture? Fantastic DIY, your fixture looks amazing! Thanks for the tip on Caribbean Imports for sourcing capiz shells, will give them a try. I just saw your DIY and I LOVE it! I am working on it now and I'm so excited but frustrated already. I have my 2 hoops taken apart (so I have 4 total; 2 inside/2outside) BUT the outside 2 that had openings will not close! :( I've tried wood glue and clamps~ I even tried masking tape spray painted...that looks terrible. How did you ever get your 2 outside hoop ends fitted together? I am almost ready to staple with my nail gun but I'm worried I'll split the wood so I thought I'd ask the expert (YOU) first! Hope you can help.